Sleepy Princess in the Demon Castle Vol. 1 Review – AiPT! This damsel may be imprisoned, but she’s hardly in distress. I’ve read a lot of manga published by Viz Media, most of which have been action or thriller titles. With that said, the company also has some sillier, more lighthearted series. 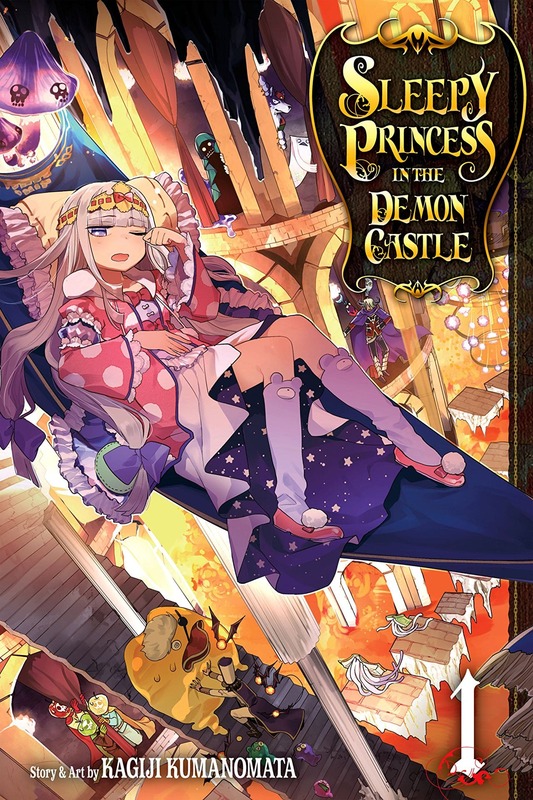 One such series, Sleepy Princess in the Demon Castle, debuted this week with Vol. 1. The manga, written and drawn by Kagiji Kumanomata, stars Princess Syalis, a human royal who has been kidnapped and is imprisoned at the titular Demon Castle. This volume collects the series’s first thirteen chapters, all of which can be read on their own but also contribute to the larger story. Does Sleepy Princess in the Demon Castle Vol. 1 make a good first impression? This series’s premise might sound familiar–a princess is forced to reside in the antagonist’s castle–but Kumanomata’s approach to the idea is delightfully original. Sleepy Princess in the Demon Castle is essentially a video game rendered in comic format. The characters have stats (such as MP), are susceptible to status ailments (such as sleep, poison, etc. ), and must obtain items to achieve their goals (like in fetch quests). The series’s videogame-esque elements are well-incorporated into the story as a whole; they pop up consistently and are usually very funny. Syalis’s interactions with the various demons in the castle are also a lot of fun. Most chapters involve her searching the castle for sleeping aids. This results in all manner of hijinks, from her stealing demons’ clothing to weave into pillows to snatching magic potions and relics. My favorites of this volume’s demons are the Teddy Demons. They’re essentially just regular teddy bears but with bat wings, and they’re adorable. Syalis discovers early on that she can brush them and use their fur for pillow stuffing. This series’s artwork does a great job bringing its fantasy videogame elements to life. Kumanomata’s artwork throughout the volume is strong. The various demons all have great designs, and the Demon Castle itself is fantastic. Its architecture is classically scary and evil-looking, with lots of high towers and black surfaces. The drama of the setting is further enhanced by frequently stormy skies with plentiful lightning. Syalis is also well-drawn, especially in the volume’s bonus pages. Most of the chapters end with pages resembling character class selection screens from roleplaying games. These pages include charming alternate designs for Syalis in which she takes on roles such as beast tamer and exorcist. There is very little about this volume that I don’t like. No part of it is bad; some chapters are just less funny than others. As a whole, the volume’s first half is stronger than its second half. This is mainly because some of the demons and other new characters introduced in the second half aren’t quite as memorable as those introduced early on. Overall, Sleepy Princess in the Demon Castle Vol. 1 is a very strong series debut. Kumanomata incorporates videogame tropes into the story effectively, delivers charming artwork, and brings unique twists to the concept of a princess trapped in a castle. I would highly recommend this volume to any fan of fun, lighthearted comics. Charming demon designs, strong artwork, and an original take on a familiar premise make this series one to look out for.